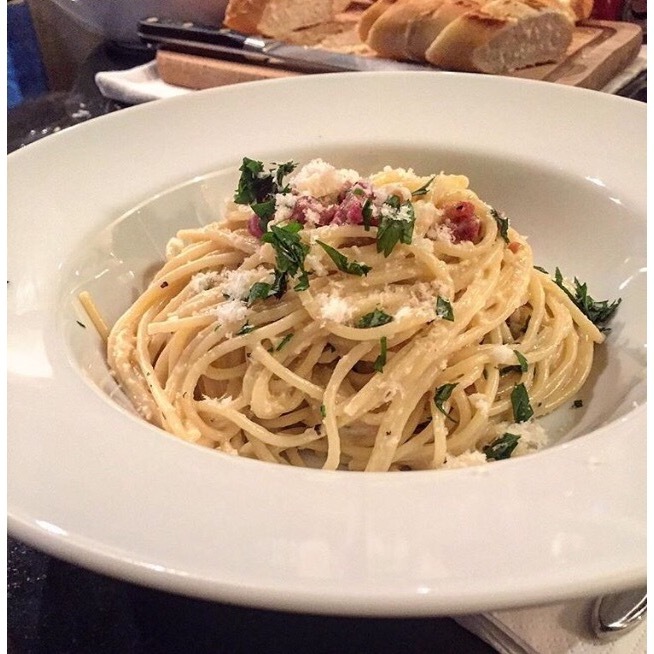 I have decided to share my recipe for carbonara, it’s really easy using just a few ingredients, and can easily feed a crowd! Perfect to feed a hoard of hungry teenagers!! I thought this would be a perfect first blog because of the simplicity. This has become a firm family favourite after going to Caldesi Italian Cookery school in London (for me it was the perfect birthday present) All I sometimes add to the original recipe is fresh parsley. Bring a large saucepan of salted water (make sure you use enough salt) to the boil for the pasta. meanwhile, heat the oil in a large frying pan and, when hot, add the bacon and fry until crispy. add the wine and reduce for a couple of mins. Set aside. Now put the pasta into the boiling water and cook until al dente. Beat the eggs and black pepper together. Drain the cooked pasta in a colander,( I always reserve some of the water just incase you need it to loosen the pasta) return it to the pan OFF the heat and add the beaten egg, bacon and 80g of the Parmesan, stir well to combine. Serve in warm bowls with the rest of the cheese scattered over the top and parsley if using. I can confirm that it’s delicious! Look forward to your next post Debz.